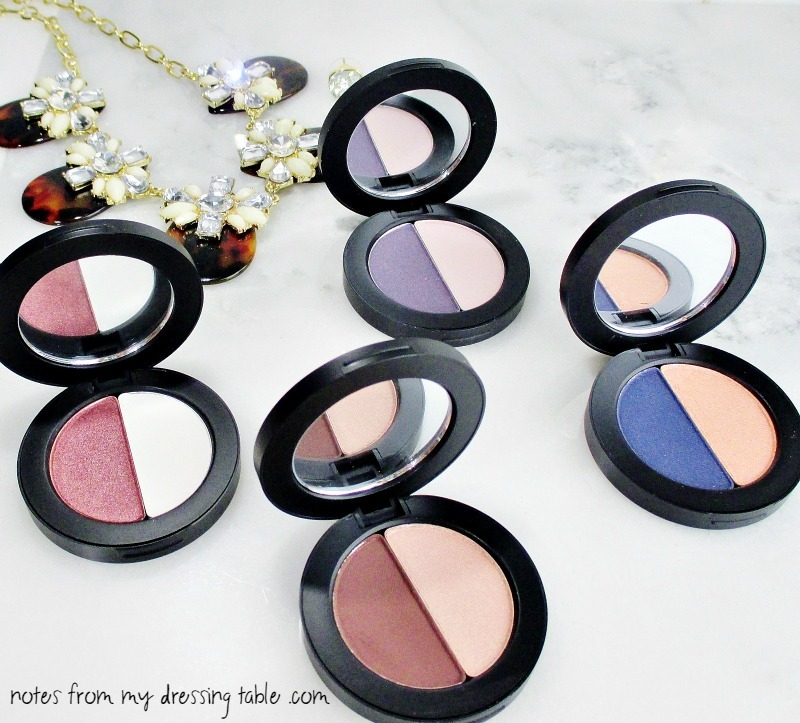 Youngblood Perfect Pair Mineral Eye Shadow Duos are new to me and I am so happy to have been introduced. 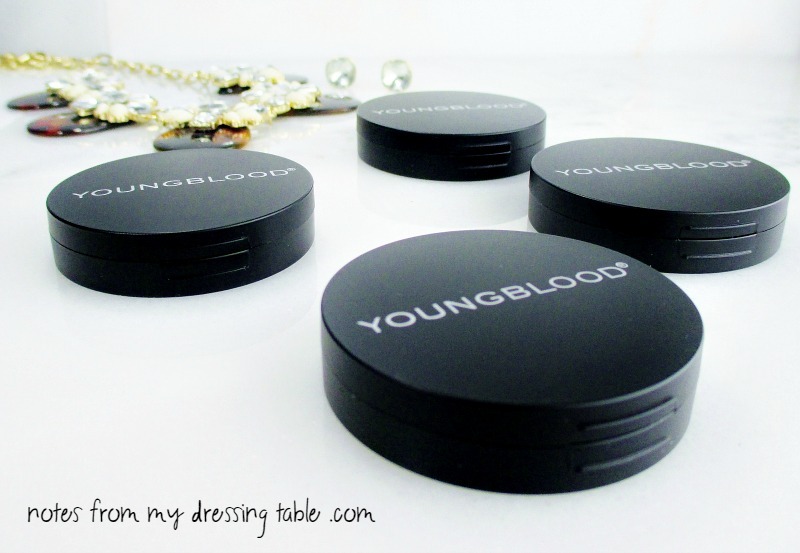 According to Youngblood, these shadows are "perfectly paired to create an alluring eye." With their sleek, round black magnetized compacts complete with a little mirror, these shadows are perfectly poppable and portable. They can be applied wet or dry, with fingers or brush, combined or used alone to create a plethora of eye looks. Virtue- Passionate is a shimmering roseberry. Pure is a clean, matte white. Charismatic- English Tea is a smooth, matte reddish brown. Calla Lily, a stunning rose gold shimmer. Desire- Iris is a satin with a subtle duochrome shift. Pink Rose gives us a soft, tea rose matte. Graceful- Azure is a clean navy blue shimmer with tiny blue sparkles. Apricot is soft and orange-y with a silvery shimmer. Mica, Zinc Stearate, Caprylic/Capric Triglyceride, Dimethicone, Lauroyl Lysine, Polyethlene, Nylon-12, Vinyl Dimethicone/Methicone Silesquioxane, Crosspolymer, Stevioside, Silica, Caprylyl Glycol, Phenoxyethanol, Isopentydiol. May Contain: Titanium Dioxide, Iron Oxides, Ultramarines, Manganese Violet, Carmine, Ferric Ferrocyanide. Swatches in the image, above! All of the shadows in Youngbood Perfect Pair Mineral Eye Shadow Duos have very good pigmentation and payoff in both swatches and on the eye. All of these shadows build and blend easily and smoothly without producing a lot of fallout. English Tea, Iris and Azure are a little stiff to the touch but they perform well. The shimmery shades can be a little flaky, your finger or brush will kick up a little excess, be sure to tap off the brush before going to the eye. I get the best performance and all day, crease free lasting power when I apply and wear them over primer. My lids are not oily but they have been forever prone to creasing and will eat my eye shadow unless I prime, first. I like these shadows and recommend them. You can buy the Youngblood Perfect Pair Mineral Eye Shadow Duos from their site, authorized online retailers or use their Store Locator to find a brick and mortar retailer or salon/spa near you. Youngblood Cosmetics are Cruelty Free, Paraben, Talc, Oil and Fragrance Free. 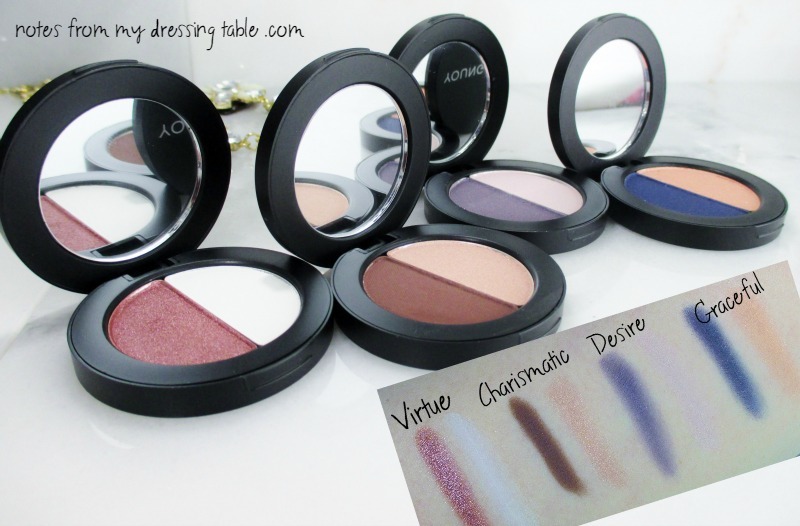 Have you tried any of these pretty Shadow Duos or any other Youngblood products? Please share and tell me what your favorites are. I've been perusing the website and I see quite a few items I'd love to try.